Did you know that your State Representatives can help you out more than just by passing bills in the Michigan Legislature? Rep. Henry Yanez was able to help one woman who contacted him when her furnace broke in the winter. There are many programs available to help seniors and those in need in Macomb County, and Rep. Yanez was able to find one such program that was able to get her a brand new furnace within 24 hours so she wouldn’t freeze in her own home. A contractor came out to the woman’s home that day, and the very next day the new furnace was installed — free of charge (and during the wait, Rep. Yanez even drove a space heater over to her home until her new furnace was up and running). 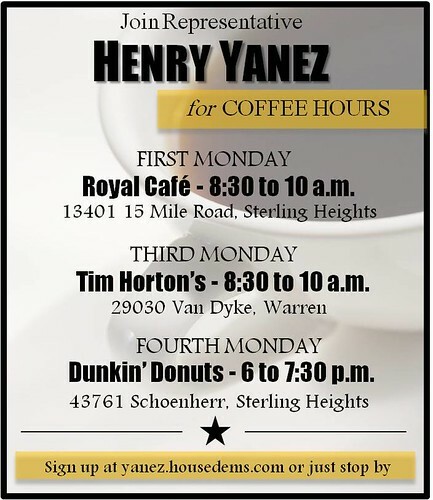 Rep. Yanez cares about our seniors. That’s why he held a Senior Scams Town Hall in Sterling Heights — because it came to his attention that one particular woman was being scammed out of hundreds of dollars every month. There was a great turnout at the Town Hall, where seniors and their loved ones were able to have their questions answered and learned plenty of information to keep scam artists at bay. With an aging mother-in-law, Rep. Yanez understands the issues facing seniors and their caregivers. And because of that, seniors know that Rep. Yanez has their best interests in mind, and he works to protect all that they have.